Has Chad Kelly locked up the No. 2 spot? The Denver Broncos looked good in Saturday night’s preseason victory over Washington, but not great. The first string offense produced scoring drives on three of the first four possessions of the game and the starting defense contained the Redskins’ offense, making it extremely difficult for them to move the football. In Washington’s six first half drives, they punted four times, turned the ball over on downs and made one field goal. Along with a convincing performance from the starters, the No. 2 quarterback, Chad Kelly once again looked like Denver’s only real option on the roster to play behind Case Keenum. Kelly was 7-of-11 for 70 yards and finished with a modest QBR of 81.6. Through his three preseason appearances, Kelly has an average QBR of 110.6 and a touchdown-to-interception ratio of 3:1. Kelly opened the second half with a 10 play, 47-yard drive that ended with Brandon McManus drilling a 45-yard field goal. The field goal put the Broncos up 17 at the time and secured crucial points. What was particularly impressive about this drive was on 3rd and 17 from Washington’s 37-yard line, Kelly was able to connect with rookie wide receiver DaeSean Hamilton for 10 yards to help get McManus in field goal range. 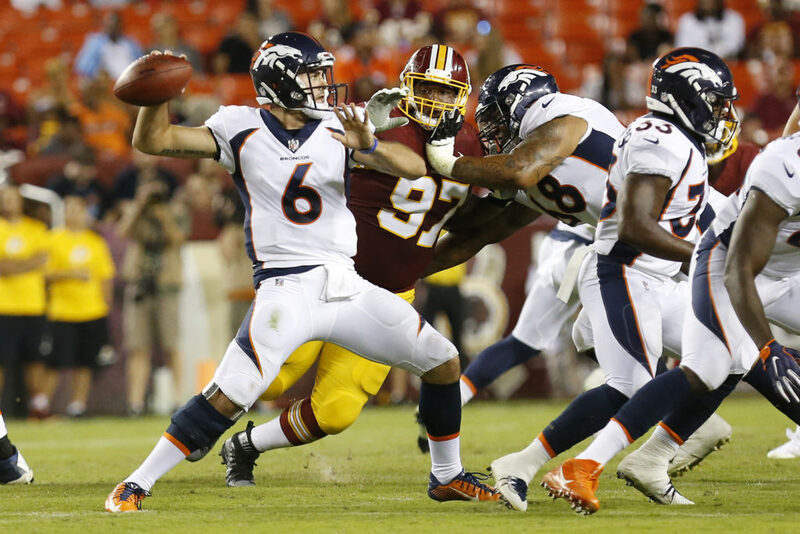 After Washington went three-and-out in both of its first two second half possessions, Kelly led a pair of seven-play drives that also ended in field goals for the Broncos. The first drive was 40 yards and took just under 4 minutes. The second was 26 yards and took 3 minutes and 18 seconds. Although we only got to see Kelly for one quarter Friday, as Paxton Lynch played in the fourth, it was clear that he is the better option of the two. The second-year QB did not find the end zone against Washington, but the team scored points every time they touched the ball with him under center and he did not make any mistakes that hurt the team. Head coach Vance Joseph decided to play Lynch in the fourth quarter last night, but the Broncos should try to get Kelly as many reps as possible in Thursday night’s final preseason game at Arizona. Kelly has undeniably won the No. 2 spot for this team, so it would be wise to get him as comfortable in the offense as possible before the real games begin.